Posted on July 9, 2012 by A. Was it overly ambitious for me to set the goal of writing, finishing, and editing a science fictional yarn for the Clarion West Write-a-thon this year? Probably. I’m spending July 3 – July 15 travelling across the country, and before that I packed my entire house into a relocation cube and shipped it off the rural Massachusetts, where I’ll be spending the next few months. Despite all this, or perhaps because of all this, I’ve actually been doing a quite a bit of writing. I have a 6,782 word skeletal draft of “Man of War”. It will probably get longer before it’s done, and then shorter as I edit it down. I’ve never had much of an interest in writing hard science fiction, though I recently read Kim Stanley Robinson’s Mars trilogy and loved it to pieces. Usually, though, I like it when things get weird. 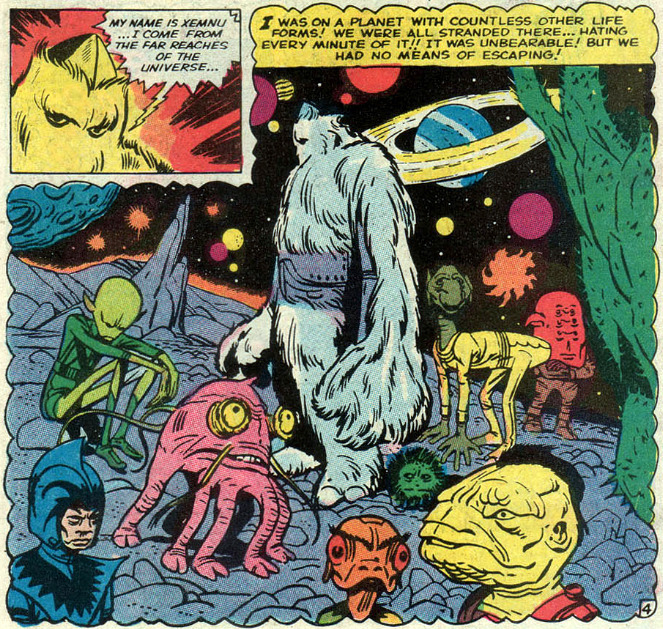 I like the Kirby sort of cosmic. As I visualize the people and places and things in this story I’m writing, I’m finding myself drawn repeatedly to animation and comics. Kirby, yes, but I’ve also been really enjoying the contemporary Prophet and Saga. I’m revisiting shows about sad kids in giant robots and machine ladies. The nice thing about immersing myself in other mediums, as opposed to focusing on prose fiction, is that I don’t have to worry so much about voice creep. I also find that studying the visual language of comics is very helpful to me as a writer of prose. Good comics are lessons in economy: a single issue can convey reams of information in 20-30 pages. They build worlds, fantastic or otherwise, with incredible efficiency. Comics also remind me to think about physicality more often. What are people doing as they spit dialogue back and forth? Where are they in the spaces they inhabit? What are their bodies communicating that their words aren’t? Comics are also great about zooming in about mundanities of the fantastic in a way that completely knocks my socks off. X-men has always been as much about interpersonal drama as it is about punching bad guys. Chadwick’s Concrete is certainly the most realistic story about an invulnerable rock man ever written. It always impresses me when a story manages to balance space aliens and ray guns with unrequited crushes and empty afternoons. I like big ideas, but I like my big ideas mixed with small moments that tell me who these people are and why I’m supposed to care about them. Anyway, I should really get back to working on this thing. Maybe I’ll just read a few issues of Before the Incal first? This entry was posted in notebook, process and tagged Clarion West Write-a-thon, comics, process, science fiction, short fiction, writing by A.. Bookmark the permalink.